The owner of The Capital Hotel in Knightsbridge is a man with impeccable taste and this can be seen in every nook and cranny of the glorious private dining rooms. Having hosted the Queen herself, surely no one could fault the royal standards of this venue. The entrance way itself is entirely classical and comfortable. This cosy elegance carries on through to the areas for hire. The Eaton suite benefits from being on the first floor, with large windows and a rather special window seating area. Natural light floods in and on the balcony are small conifers providing that refreshing natural touch. Clearly, the design focus has been on a home from home feel and you’ll be entirely at ease within this luxurious, restful space. Moving on to the Cadogan suite at the Capital hotel, larger in size and with provision for up to 24 for dinner, the feel is more feminine but just as calming and ordered. The space can be easily tailored for the occasion; the table decorations in particular can be matched to the colour scheme you have in mind. The sitting room on the ground floor catered for the Queen in 2009 and it is here that her Royal Highness ate surrounded by modern opulence. With big windows that look out onto pretty Basil Street, the tranquility of the hotel is notable despite its positioning in bustling central Knightsbridge. The room packs more of a punch that the other dining rooms with electric fuchsia armchairs and bold floral wallpaper set against silver walls and a grey graphic carpet. The patterns blend perfectly and indeed, the themes of design and comfort ring true. This hotel embodies escapism. Nothing is overly formal and yet everything is truly lavish. Known to shelter celebrities keen to relax in peace you’ll be likely to find a sense of Zen here no matter the occasion. 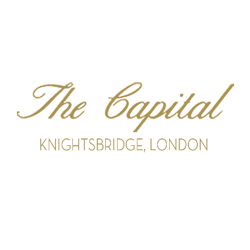 Ranked by the prestigious Zagat guide 2011 as top restaurant in Knightsbridge, the private meeting and dining rooms at The Capital offer exceptional value for outstanding cuisine in an enviable location.